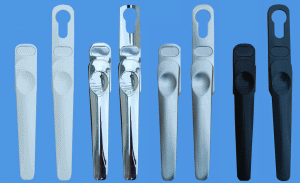 Bi Fold Door Handles and Spare Parts. Handles are available in different colours either with or without keyholes. Bi Fold Door Handles and Spare Parts. Bi Fold Window Handles with no Keyhole Escutcheon. Bi Fold Escutcheon Handles with Keyhole Esctcheon.